CAPE CANAVERAL, Fla. — SpaceX has completed 21 missions in 2018, a rate of launch that has surpassed what some state-run agencies have accomplished this year. The last on its 2018 manifest was a payload for the United States Air Force, one that had weathered numerous delays this past week. 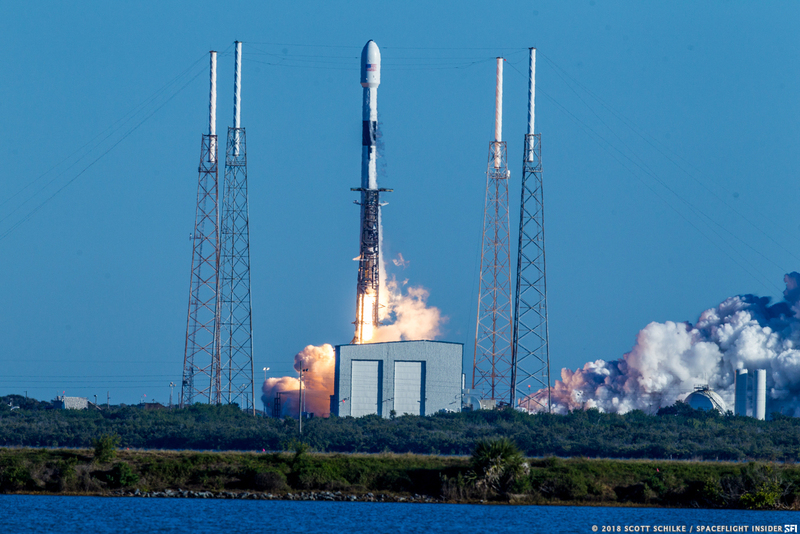 At 8:51 a.m. EST (13:51 GMT) Dec. 23, 2018, one of the company’s Falcon 9 rockets lifted off from Space Launch Complex 40 in Cape Canaveral, Florida, with the GPS III SV01 spacecraft, the first of a constellation of third-generation of GPS satellites that should be comprised of 10 satellites. This particular vehicle, SV01, is named “Vespucci” after Amerigo Vespucci, the Italian explorer who the Americas were named for. Ten GPS III satellites are expected to be launched by 2023. “In the coming days, GPS III SV01 will use its liquid apogee engines to climb into its operational orbit about 12,550 miles above the earth. We will then send it commands to deploy its solar arrays and antennas, and begin on-orbit checkout and tests, including extensive signals testing with our advanced navigation payload provided by Harris Corporation,” said Johnathon Caldwell, Lockheed Martin’s Vice President for Navigation Systems. Lockheed Martin is the prime contractor for the GPS III spacecraft. It is hoped that the 8,500-pound (3,900-kilogram) Vespucci will back up the United States’ current constellation of 31 GPS satellites that provide positioning, navigation, and timing services for over four billion users across the globe. Engineer’s with the Air Force and Lockheed Martin handled the spacecraft’s launch and checkout operations. However, once the satellite has been deemed ready to begin its work operations will then transfer over to the USAF. 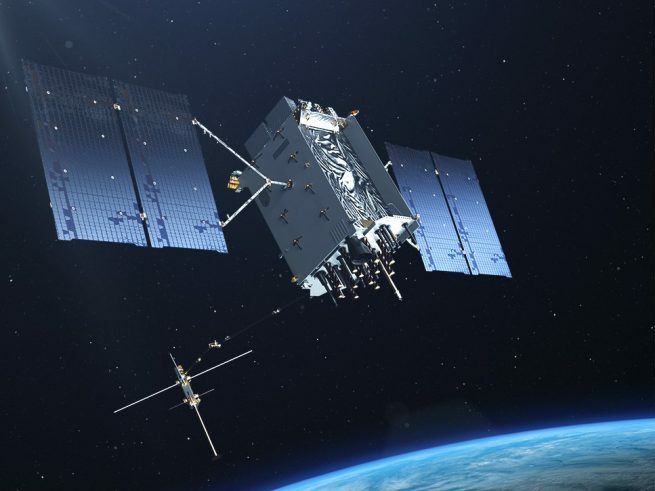 “The modernization of GPS has been an outstanding collaborative effort and this brings us another step closer to launch,” said Gen. John F. Thompson, SMC commander and Air Force program executive officer for space in August about the arrival of GPS III SV01 at the Cape. In the days before launch, Vespucci was safely cocooned within the payload fairing on Dec. 7 at Astrotech Space Operations in Titusville, Florida. This part of the rocket is what protects payloads as they make their way through Earth’s atmosphere, shielding it from the pressures and friction generated by the vehicle’s “stack” traveling uphill toward orbit. Upon launch, it took about 2 minutes and 44 seconds for the first stage to deplete its fuel and cut off its engines. While this was a fresh Block 5 first stage, no landing legs or grid fins were attached, meaning it flew in an expendable mode. According to the company, the mission requirements meant that the stage would not be recovered (in essence, the amount of energy needed to get Vespucci to its proper orbit precluded a Return to the Launch Site or RTLS). Once the first and second stages separated—about four seconds after the first stage’s main engine cutoff—the second stage’s lone Merlin 1D engine fired to continue pushing Vespucci to orbit. The payload fairing was no longer needed at about the 3 minute, 22 second mark and separated from the rocket as it is designed to. About 8 minutes, 16 seconds into the mission, the second stage achieved a parking orbit and shut down its engine to begin a roughly 1 hour coast phase. At 1 hour, 9 minutes into the mission, the second stage ignited its engine for a second and final time to perform a 46-second burn to achieve its required medium-Earth orbit to deploy the spacecraft. Said deployment came about 47 minutes later. 2018 saw SpaceX fly a record-breaking number of rockets, debut its long-awaited Falcon Heavy and Block 5 Falcon 9 vehicles as well as a number of other major milestones in the company’s growth. SpaceX kicked off the year with the launch of the classified Zuma mission for Northrop Grumman in early January. At the end of the month, SpaceX orbited GovSat-1 for the government of Luxembourg. Less than a week later, on Feb. 6, Falcon Heavy soared for the first time, carrying Elon Musk’s personal Tesla Roadster. Later in February, SpaceX launched Paz, a commercial imaging satellite, and two Starlink test satellites known as Tin-Tin A & B. In early March, Hispasat 30W-6 lifted off from SLC-40 to provide better communications coverage for Hispasat in the European, American, and African region. March came to a close with the fifth batch of Iridium NEXT satellites taking to the skies from the U.S. West Coast. 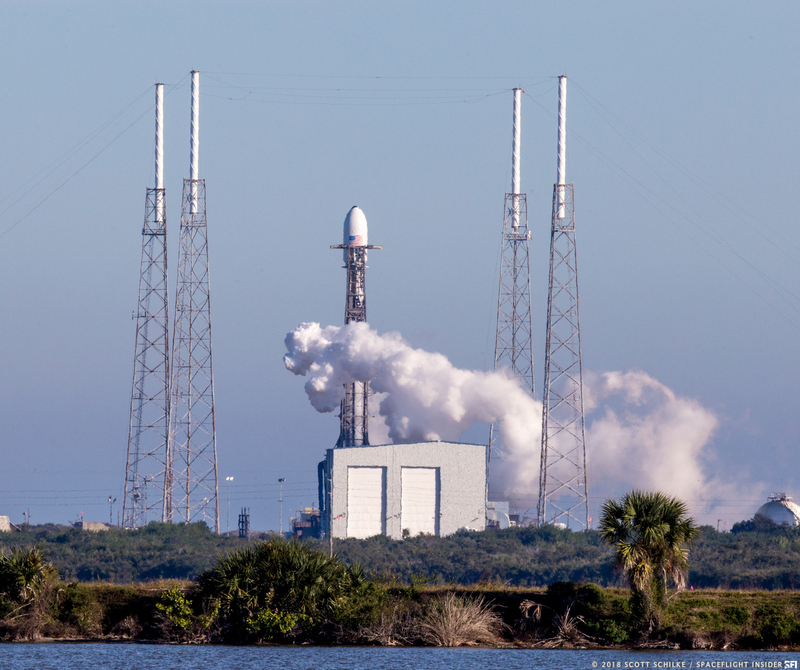 On April 2, the CRS-14 Dragon was launched to the International Space Station, and would be the first of three such missions SpaceX carried out in 2018. On April 18, another Falcon 9 blasted off with TESS, the Transiting Exoplanet Survey Satellite on behalf of NASA. 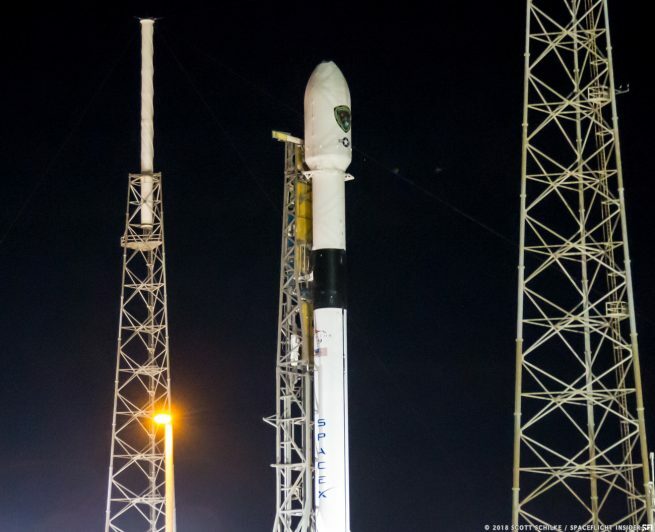 May 11 saw the much-anticipated debut of the Block 5 Falcon 9 first stage, with the launch of Bangabandhu-1 communications satellite. Later in May, five Iridium NEXT satellites and NASA’s GRACE Follow-On mission shared a ride to orbit from Vandenberg. Early June saw the launch of the SES-12 mission from SLC-40. The first half of 2018 came to a close with CRS-15 arcing its way to the space station. After an almost month-long hiatus, SpaceX launched Telstar 19V from Florida and the seventh Iridium NEXT mission from California in quick succession. On Aug. 7, Merah Putih lifted off into the night sky destined for geostationary transfer orbit, to provide enhanced communications coverage over India and Indonesia. On Sept. 10, SpaceX launched its second mission of the year for Telesat, with the Telstar 18V satellite. On Oct. 7, SAOCOM-1A, an Argentinian Earth-observation satellite, lit up the early evening skies above Vandenberg and provided southern California residents with a spectacular light show in the sky above and performing the first West Coat RTLS landing of a first stage. Then on Nov. 15, SpaceX launched Es’hail 2 for Es’HailSat of Qatar from historic Launch Complex-39A located at NASA’s Kennedy Space Center in Florida. On Dec. 3, SSO-A launched from Vandenberg with 64 smallsats for various government, commercial, and academic customers into Sun-synchronous orbit. Less than two days later, CRS-16 launched from SLC-40. As noted and as the headline of this article implies, there have been a great many attempts to launch GPS III SV01. Originally the spacecraft was slated to fly atop a United Launch Alliance Delta IV. However this was changed to a Falcon 9. The mission had been scheduled to launch this past September and then October. When the mission was provided a more specific launch date (Dec.15) it looked like all was set – not so. Then an “out of family” sensor reading on the F9’s first stage caused a scrub on Dec. 18. This was followed by more sensor issues on Dec. 19, poor weather on Dec. 20, high upper level winds on Dec. 22 and nothing whatsoever today. With Vespucci now safe on orbit, Hawthorne, California-based SpaceX is gearing up for 2019.